Can this old person, crunched up in the sun outside the LGB cafeteria with a stray leaf in her hair really be me? I’m waiting for Lucy, my granddaughter, who has offered to show me round the new Centre des arts. Some buildings have changed; the kids streaming out of school haven’t. Even their jeans and tee shirts could be emerging from my class twenty or thirty years ago. I see them and know them. They look free. Lucy, aged nearly fourteen, educated to date in New York, explodes from somewhere, wildly American, with her twin, Zara, and friends: a Russian, a Korean, a Brit, all of them new to Ecolint. Already they have that “je ne sais quoi” that will mark them for life as belonging to this place. 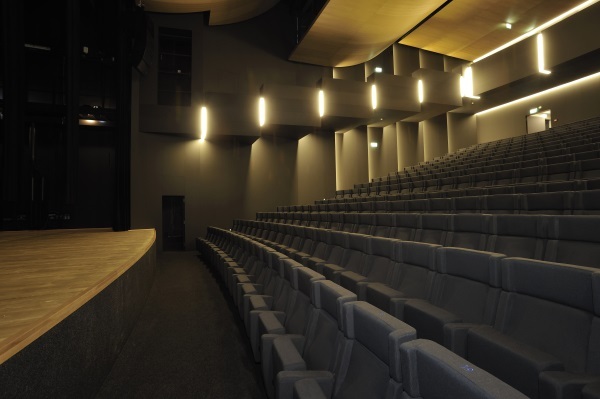 The auditorium in the new Centre des arts, La Grande Boissière. We wander down the ramp and into the Centre. It’s impressive but all the rooms are locked–a gentle irony. I seem to have spent a large part of my life as a would be drama teacher battering at locked doors, especially those opening onto spacious interiors; space is the vital oxygen of drama teachers. The teachers and students have fled into their weekend, but an obliging employee unlocks the theatre. Despite my being old and unsentimental, a little catch of breath escapes. Elegant grey seats, sophisticated lights directed from above my head onto a wide stage. We are in the old cafeteria of the sixties, where the formidable Mme Paroisse rules over a kingdom of white suited waiters who balance trays, walk through our workshop lessons, set tables. Spurning our dreary little assigned classroom and desks, we are driven out into the rain. We wander into the wintry Greek Theatre, shelter under dripping trees. Thespians defying the elements, we are bent on expression: we are Ecolint: we do original things to arrive at unusual results. The Drama Department in 1975: Mr. Price, Mr. Shapiro, Mrs. Knight. A wealthy parent saves us from chronic pneumonia and gives us the money to buy space: the very first Drama Workshop. I make blackout curtains and we "move through an outer darkness, not in our right minds". Our unusual result is born. A few years later, in a melodramatic immolation, our aspirations (but not ourselves) are snuffed. Photographs of productions and a collection of costumes, even historic tape recordings like the visit of Mountbatten to the school graduation all vanish in this twilight of the gods. But the first birth produced offspring and finally…this new Valhalla rises from the ruins. Lucy shows it off and I smile. I sink back to the present in a moving time machine through a gleaming steel and concrete palace, admire the art on the walls, peer through windows at a film studio flashing its technology. Lucy loves Art. She’s lucky. But so were we. If satisfaction is achieved in relation to effort expended, my students and I lived through the golden years, only a little damp. You can find out what's keeping Mrs. Knight busy these days in our Former Staff: Then & Now section.